Scored 3/4" from top and corners for easy folding and binding. Note: A minimum quantity of 190 must be ordered, and in units of 10 thereafter. Southworth 25% Cotton Manuscript Cover, 30lb, 9 x 12 1/2, 100/PK - Manuscript covers protect legal briefs, scripts or similarly shared documents from wear and tear. 25 percent cotton fiber provides heavyweight protection. Tops are scored, and corners are clipped for folding and binding. Each 30 lb. 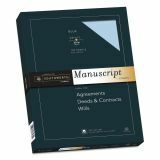 manuscript cover features a watermark, smooth finish and an acid-free, lignin-free construction. 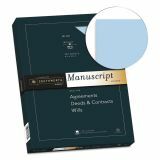 Manuscript covers also contain a high percentage of recycled material.